Product code: ES6543 Categories: Sold Items, Sold Rings. Here is a very special antique pearl and diamond locket ring that is as amazing to view from the front as it is from under the ring. 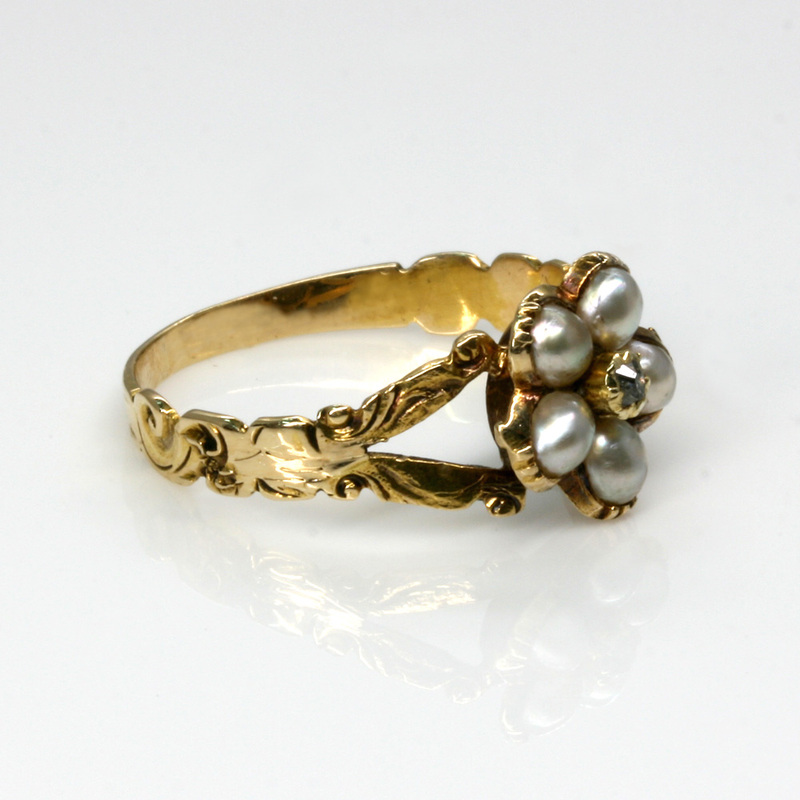 Hand made in the Victorian era, this ring dates from the 1880’s and is set with five pearls surrounding a diamond in the centre. Measuring 9.8mm in diameter, this is the perfect size to fit on any finger and wear all the time as the cluster is neither too large or small and the ring as a whole is very comfortable to wear. This cluster design is so charming and leads to a gorgeous hand carved split designed band which adds to the charm and character and is just one reason why antique rings have that something special that you often wont find in today’s modern jewellery. The engraved band goes all the way around and really adds that something extra to an already charming ring. Then turning the ring over reveals a locket compartment which can be used for a lock of hair or a photo making it even more personal and romantic to the wearer. 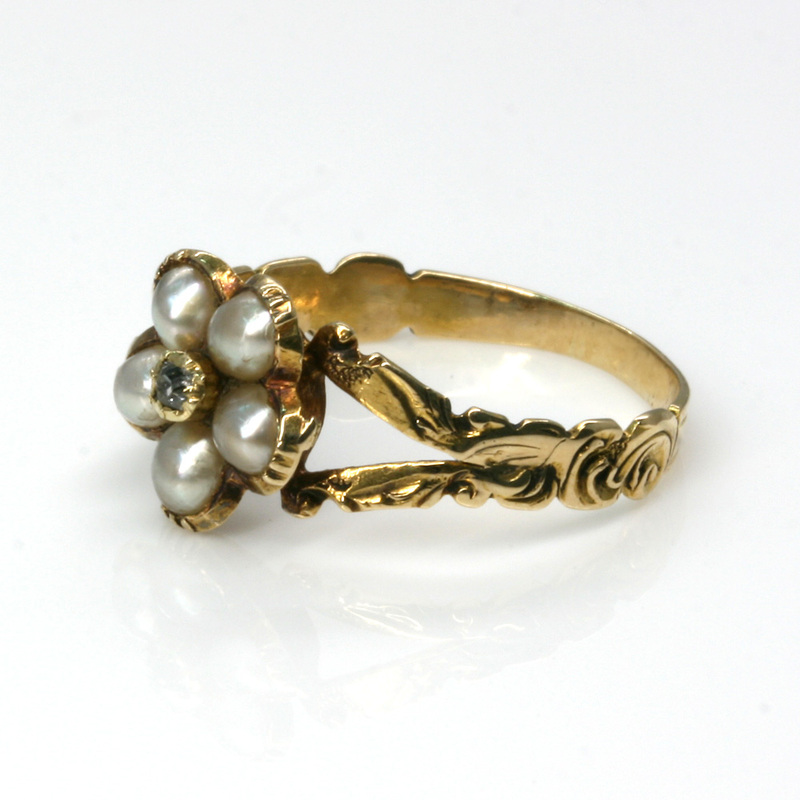 From all angles, this antique pearls and diamond cluster ring is so lovely and full of character and can be made so much more personal with the locket compartment in the back of the ring.